Clean, ethical shots are something that all hunters aspire to. Sometimes—like when hunting big, dangerous game—they’re vital. It is a sign of respect for the quarry, and a badge of honor of the hunter. Of course, these shots are always the culmination of skill and practice. That is why it is particularly impressive that this young bowhunter drops a bull elk in one swift blow. Skip to 0:58 to see the actual shot. According to Fullchoke Outdoors, the video was taken by their Pro Staff member Clayton Coyle on a hunt four years ago. He was 13 at the time. No location was given. WARNING: The video below contains some graphic content. Viewer discretion is advised. Speed shooter Jerry Miculek has started off his new gun myths series with one of the most-used tricks in Hollywood: the pillow suppressor. The use of the simple household item to soften the sound of a gunshot has been grossly misrepresented in film. In a deviation from his usual videos—which usually involve slinging lead downrange at superhuman speeds—Jerry responds to the myth with some scientific facts. You can see his results below. Champion speed shooter Jerry Miculek may be serious about competition, but that doesn’t mean he can’t have some fun from time to time. For his latest video, Jerry puts 40 rounds on target within 3.5 seconds. His method of delivery? Two .45 ACP Kriss Vectors and two very quick trigger fingers. Although many may not realize it, taxidermy can be a stressful job. After all, no hunter wants his prize disfigured after a costly and memorable hunt. Taxidermists need to also be skilled in tanning, painting, and have an in-depth knowledge of wildlife anatomy. However, veterans of the art also say taxidermy can be very gratifying for someone with an interest in nature, and offers a great degree of creative flexibility. Tim McLagan of McLagan’s Taxidermy in Oregon has been at the job for 17 years, and his hands have shaped everything from kudu to cape buffalo to even lamps from shed antlers. Watch as this master taxidermist turns an archery mule deer into a cherished memory from start to finish. A video camera set up near a rock demolition site captured one deer’s fortunate escape. The recording starts off with two deer foraging near some snow-covered rocks, and one flees into the forest after hearing the warning sirens. The remaining deer raises its head and stares quizzically off into the distance, right before explosions demolish the ground beneath its feet. Miraculously, the deer manages to escape off into the trees, and hopefully not too traumatized by the experience. As the video’s description says, Bambi got very lucky indeed. This short clip by French thrill-seeker Sébastien Montaz-Rosset is sure to get your heart racing. In a sport they call “skylining,” Seb and his crew of daredevils seek to master the art of tightrope walking, thousands of feet in the air. That’s right; the tightrope they are attempting to cross is extended between two hot air balloons high above the French Alps. Steven Rinella, host of MeatEater on Sportsman Channel, is not unused to looking a meal in the eyes. On this moose hunt in British Columbia, however, the meal looked back. Why did the wild pig cross the road? To join the 400 before it of course. Okay, so the amount of swine in this video falls short of that number, but it will leave you guessing as to when the conga line of pigs end. As hunters can readily attest, if you see one pig, there’s likely to be more nearby. Wild hogs gather in groups called sounders, which can range from 10 to 50 individuals. These large groups of swine can cause significant damage to the environment and is considered by many U.S. states to be an invasive species. In fact, many wildlife departments are encouraging hunters to harvest as many wild pigs as possible in order to control their numbers. If not, a scene like this may happen to a place near you. Keith is on an epic hunt “down under” this week spotting and stalking the legendary New Zealand Red Stag. Hunters familiar with Cape buffalo can attest to the strength and ferocity of these large bovines, and now so can this lion. Standing up to five feet at the shoulder, Cape buffalo is considered one of Africa’s “big five,” the most dangerous of the continent’s game animals. With a nickname like the “widowmaker,” the Cape buffalo has a reputation for being more than capable of handling predators. Even hunting in groups, lions sometimes find themselves out-muscled in encounters with bulls. The video taken below is what happens when lions get on their bad side. A trophy deer is in the eye of the beholder. Uncle Millis decides to go after a buck with a unique rack. Everyone loves a little character. Get full episodes of Deer City USA for free on CarbonTV: http://goo.gl/ud6OkP. Be sure to like the video and subscribe to http://goo.gl/ABehi8 for more great videos! A Facebook post from one local news station has led to a rescue by hovercraft. ABC 6 News posted a picture of a deer stranded on Minnesota’s Albert Lea Lake. The deer and two others had wandered onto the icy surface of the lake and were trapped for at least two days as the station’s Facebook followers wondered what was being done. Eventually, the father-and-son owners of a local hovercraft company decided to take matters into their own hands and piloted two hovercraft to the lake on Monday. There, Doug and James Kenison found three deer about a quarter mile from shore. While the deer tried their best to stumble back to safety, the pair attached the animals to their hovercraft with rope and ended up towing them back to shore. The deer were unharmed and after a bit of recuperation, quickly ran off. James Kenison told ABC 6 that the idea to rescue the deer came naturally to them since they owned a hovercraft company. It should be noted that rescuing a large wild animal such as a deer can be dangerous under any circumstances, and doubly so when on a partially-frozen lake. 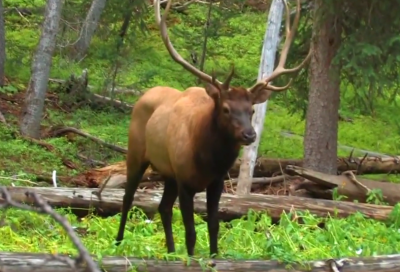 This quick trail camp clip from Stuck N The Rut starts out with some neat shots of cow elk playing in a wallow, then skips to another shot of a rutting bull taking a dip (before looking for a little love from his ladies). Toward the end of the video a wolf charges the wallow trying to take down a small cow. Great footage! Live, antler-locked deer are an uncommon sight for hunters, but they frequently have the courtesy to be on dry land for outdoorsmen looking to lend a hand. In the video below, an Indiana hunter and son came across an antler-locked buck struggling with its deceased opponent in what appears to be a small lake. As the deer desperately tried to keep its head above the water, the Andersons gave the entangled antlers a few whacks from an ax to free the live buck. Last week OutdoorHub posted a video of two hunters who attempted to shoo away an agitated buck and almost got gored for their troubles. As with any hunting trip, there was a story to go along with it. We have since found the full video from which the clip was taken (which you can see below), as well as tracked down the hunters in it. As it turns out, Chad Yousey and Joey King found the two bucks entangled after a fight. One had already died while the other was struggling to free itself. Risking life and limb, Yousey and King decide to give the deer a hand, but were not met with gratitude. Instead, the buck gave them a closer look at its antlers than they would have liked. Using quick, methodical cuts, this man shows an impressive amount of skill with a blade as he thoroughly strips down a deer from skin to guts in under two minutes. According to the video, his name is David and he works at Peach Orchard Deer Processing in Dalzell, South Carolina. The processor has been in business since 2001 and now currently employs 12 employees. If they are all as skillful as David, Peach Orchard could probably handle deer meat for the greater part of the state. Ever wonder what your bullet is actually doing as it exits your rifle or pistol? Check out this video of underwater, slow motion shooting! !